According to Wikipedia the meaning of Trifle is an English dessert dish made from thick custard, diced fruit interwoven with sponge fingers or more delicate sponge cake thin layer and/or fruit juice/syrup (fruit trifle) and almost always topped with whipped cream. The fruit and soft sponge layer (ladyfingers) are suspended in fruit-flavored jelly/gelatin. These ingredients are usually arranged to produce three or four layers. 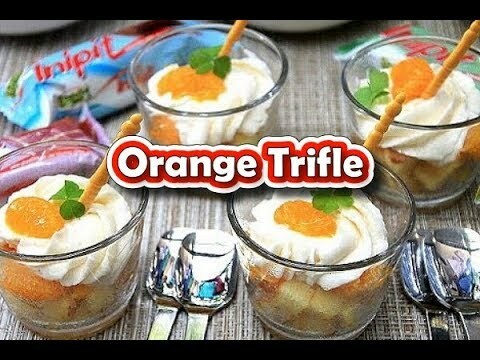 This delicious and fancy looking Lemon Square Inipit Orange Trifle Recipe is very easy to prepare and a time saver dessert. This is a No-Bake Dessert that will capture the heart and the palate of your guests especially kids. Who needs to bake a sponge cake for dessert when there’s an INIPIT from Lemon Squares, a sponge cake sandwiches with creamy filling. First, we need to prepare all ingredients needed. Open a can of orange segment and drain well, reserving the syrup for later on. Open 4 pieces of Lemon Inipit and cut into small cubes and set aside. Prepare your whipping cream or thaw a tub of cool whip. Now, that we are ready, let’s assemble our Inipit Trifle Dessert. Arrange 4 mini dessert glasses and fill each glass with diced Inipit about half’s full. Using the reserved syrup, drizzle about 2 teaspoons of syrup on each glass, just enough to moisten the cake. Top with orange segments about 4-5 on each glass. Top orange segments with a dollop of whipped cream on top, if you want to look pretty use a piping bag with a swirl tip. Lastly, top with a single orange segment and mint sprigs. Chill for at least 10 minutes before serving, you can also add a plastic skewer on each for presentation. Lemon Square Inipit Orange Trifle Recipe is a very easy to prepare and a time saver dessert. This looks an interesting recipe to try and has all the ingredients I like. And its simple to make. Perfect for me.